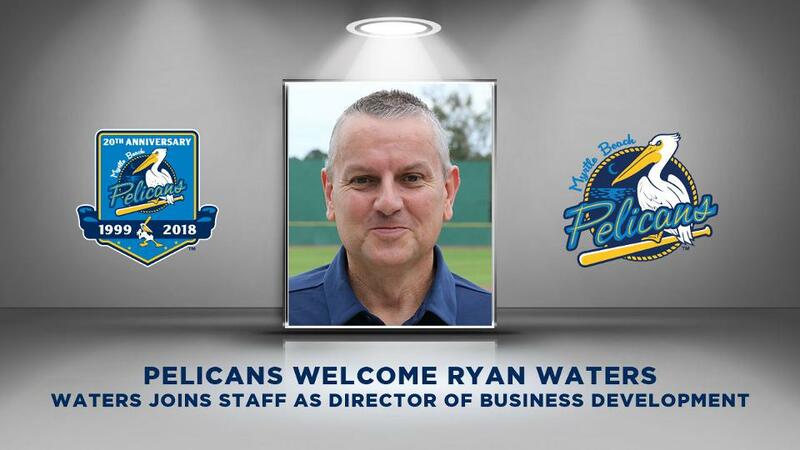 The Myrtle Beach Pelicans are excited to announce Ryan Waters as the newest member of the Front Office staff. Waters, a native of Augusta, GA, will take on the role of Director of Business Development for the Pelicans. "Ryan brings with him a vast knowledge of professional sports and the local business community," stated Pelicans General Manager Ryan Moore. "His successful history in sales and marketing will be an asset to our staff. We're excited to have him on board and look forward to the positive impact he'll have on our team and the community." Waters moved to the Myrtle Beach area in 2006 as a tournament director for the National Golf Association/Hooters Pro Golf Tour and in 2010 was named Vice President of Tour Operations and Media Director. For the past two years, he has served as Director of Membership Sales and Development for the North Myrtle Beach Chamber, CVB where he continues to serve as a member of the chamber's Membership Council. Before joining the NGA/Hooters Pro Golf Tour, Waters served as the Midwest District General Manager for Alamo Car Rental's Local Market Division covering the states of Arkansas and Oklahoma. Waters also served as Marketing Director for Little River Fishing Fleet and Coastal Scuba in North Myrtle Beach. Waters was born in Augusta, GA and raised in Columbia, SC, where he attended the University of South Carolina. He holds an associate's degree in business administration and accounting from Midlands Technical College. Waters resides in Loris with his wife, Nikki, and stepson Conner. His family attends Loris First Baptist where he has served as Awanas Course Director and is heavily involved in the youth ministry.